Wiru is the local Anangu people’s word meaning ‘beautiful’. I’d expected the landscape surrounding the imposing monolith we’ve come here to see to be stark and unforgiving. Instead, the intensely red soil is punctuated by pretty flowers, lush plants and hardy, albeit short, trees. While life in Australia's Red Centre may be challenging, everywhere is surprisingly ‘wiru’. The first distant sighting of Uluru, or Ayers Rock, is from the air for those on the right side of the plane, which was in fact the left side on our flight. Over the next two days, we are treated to various and ever-closer views of the Rock before we get near enough to touch it – that’s touch it, not climb it, but we’ll get back to that later. Our first stop as we traverse the Northern Territory is actually Kata Tjuta, which means ‘many heads’ – a fitting name for Uluru’s more irregular-shaped neighbour, also known as 'The Olgas'. We are met by Joe, our Intrepid guide, at the Ayers Rock Resort, when he gives us strict instructions to purchase a litre bottle of water to ensure we remain hydrated on our upcoming hike. It’s late November. Luckily, the summer sun – and the accompanying flies – is yet to make itself fully felt, which makes for a pleasant, hour-long round trip into the Walpa Gorge. Above us, the looming domes of Kata Tjuta feature enormous pockmarks, which leave little doubt over the origins of the equally large boulders that litter the gorge floor. Fear not, however, the last boulder parted company with the cliff face thousands of years ago. On our way to Uluru, Joe starts to explain the parts of local mythology that have been shared. As we drive around the circumference of the Rock, we learn how the shapes, caves and crevices of the monolith’s surface convey great spiritual meaning for the indigenous people. 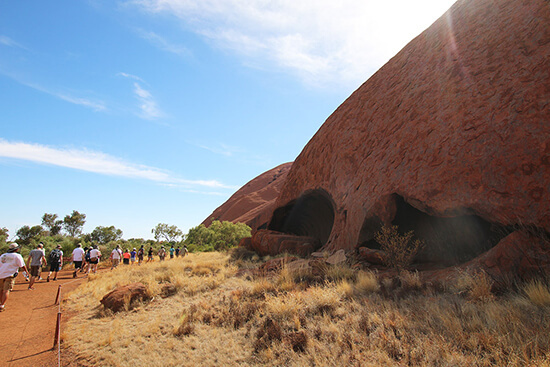 Uluru is both church and bible – a place of worship that has its mythology written across its majestic face. A retired detective from Brisbane, Joe is loving his second career as a guide and is the perfect mix of knowledgeable and entertaining. Firm but funny with it, he keeps our entire group on track with ease – a necessity for what is a pretty packed agenda. As the day starts to draw in, Joe is keen to get us to his favourite place to view Uluru at sunset in order to snag a good spot. It’s not completely isolated by any means, but not as busy as the designated viewing location. Having cracked open the bubbly, we turn our attention to the star attraction. With a hundred or so lenses trained upon it, Uluru is under pressure to put on a show and, obliging, its colour slowly changes to a deeper red before our eyes. Back at the resort we dig into dinner where we find the bush tucker menu includes kangaroo. Cooked in chilli sauce, it’s hard to distinguish from beef, although it’s possibly a little tougher. We are also assigned our tents, which prove perfectly comfortable with proper beds and a fan to keep us cool. As we have an early start to catch the sunrise, we forgo a drink under the stars and retire early. The next morning we are glad we did. We arrive at the start of the Uluru base walk in semi-darkness and ensure we have refilled our water bottles before starting the 6.2-mile trek. 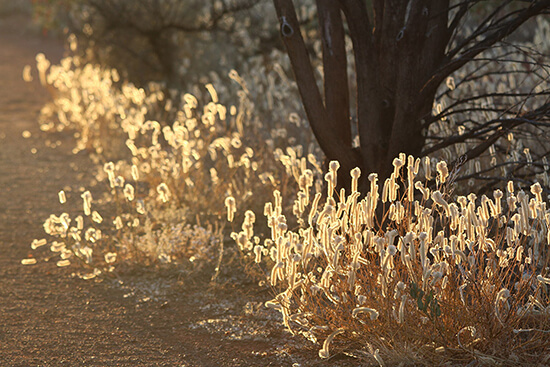 As the sun rises, it not only catches Uluru, it also bathes the furry-looking flowers that line the pathway and they too are set aglow. The shadows shorten rapidly during our base walk and it takes a few hours to explore the caves, watering holes and undulating parts of the Rock that become waterfalls if you’re lucky enough to be here when it rains. Quite rightly, to preserve this National Park’s natural beauty – and possibly also because of the astronomical installation costs quoted by Joe – there are only limited facilities available around the base. Unfortunately, with some considerable distance remaining, I find myself caught short after our early start. With the situation quickly becoming increasingly desperate, I receive no small measure of relief when our designated meeting area looms into view just in time – although not before I have had a somewhat spiritual experience of my own. Even with hindsight, I am not sure how to time this better. Consider this a warning and maybe take fewer pictures! While the rest of the tour group continue on from here to King’s Canyon, we have opted to stay one more night in Uluru. We reluctantly part company with Joe but more than happily check-in to Sails in the Desert, Ayers Rock Resort’s most luxurious accommodation and a real treat. 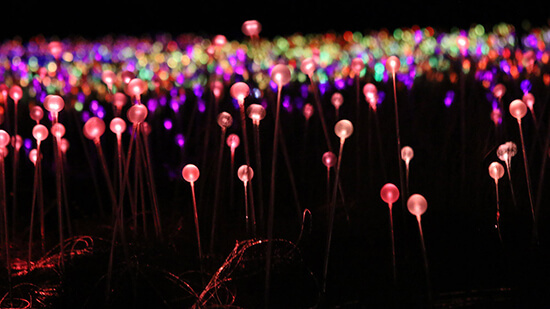 We spend a few blissful hours relaxing by the pool, the heat of the day subdued by some light cloud cover, before getting ready for the reason behind our extended stay – Bruce Munro’s Field of Light. Walking through this haunting installation and listening to the sounds of the desert is an experience I will not quickly forget. Having attempted a few shots, it becomes obvious that it’s nigh on impossible to take a picture that comes close to capturing how special this sublime spectacle really is. But this is a blessing in disguise. Putting the camera away, I am fully drawn into the moment. The gently swaying bulbs are captivating as they change colour from white to pink to red to blue. Paths meander here and there through the twinkling lights and I delve back in to the field several times. Before leaving, I take a seat at its edge to appreciate the sheer scale of this mesmerising artwork and – in the midst of another somewhat spiritual moment - only one word springs to mind: wiru. Simply, wiru. 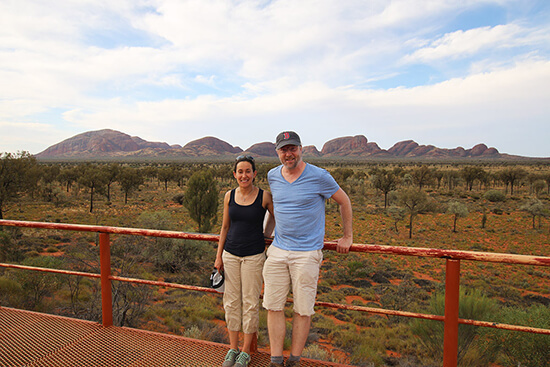 Discover Uluru and Kata Tjuta on our Sydney, Rock and Reef Journey. Make an appointment with one of our Travel Experts, and start planning your Australia holiday today.